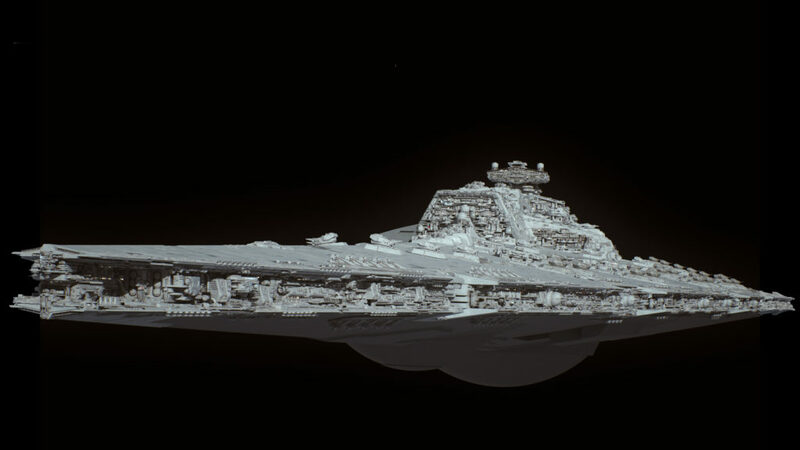 Though I admire the lack of blue tint in things like Star Wars Revisited projects, something about seeing that hue casted upon a ship to give out that cold feeling hits a chord! Fractal, if you have the time, would you be willing to upload an image of the Bellator’s weapon palate? I know for a fact that you put a great deal of effort into every detail and it’s a shame that the smallest weapons tend to get lost in the larger images. you should upload to sketchfab so we can view its full glory! Assuming both sides of the ship have an equivalent amount of weapon, I counted 325 PD turrets on the trenches alone. Just as beautiful as the original! I also love the lighting in the 65th and 66th pictures looks precisely like the lighting you’d see in the original trilogy. Simply amazing. I wonder how far into the outer rim these flagship Bellators could travel. The pictures you mention look like they are en route to Tatooine haha. I just had a terrible idea: 3D print Fractal sponge models on a massive 3D printer. Shame that unless you’re willing to invest thousands, nay, tens of thousands, it wouldn’t work. That is definitely the right idea. 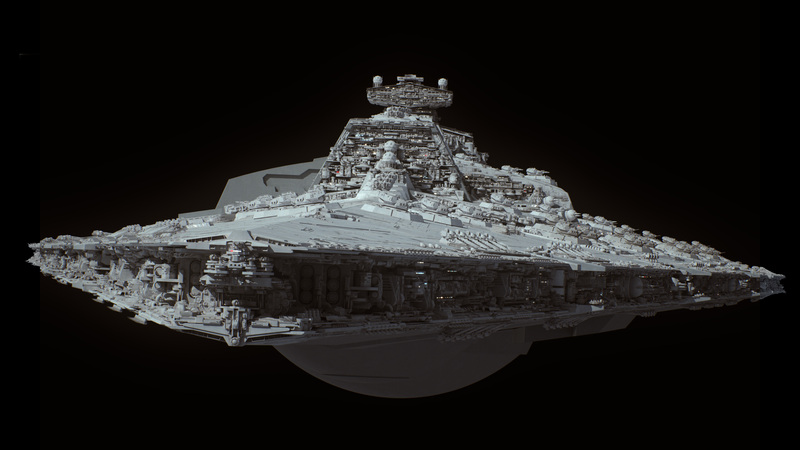 That level of detail, makes you wonder if any game devs are approaching Fractal to do some early mockups of their own space fantasies. Are those forward torpedo tubes in shot #2? Probably. You can generally distinguish those from, say, tractor-beam dishes or other round widgets ’cause our host tends to plant short rows of ’em on heavier ship designs. Oh man! Soooooooo excited to try out the slide, too! Just remember: dianogas *always* get right of way (and any shiny stuff you didn’t leave in the locker). love it man its amazing!! Hi Fractal, do you have anything planned for this ship unknown ship from DE? 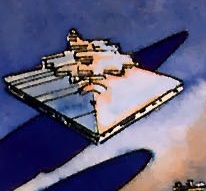 Looks like it has dome on top of the hull, bridge in the middle of the ship and some bulky square superstructure behinde? Really weird for KDY design. P.s. Amazing work, as always. That dome look like a gravity well generator. 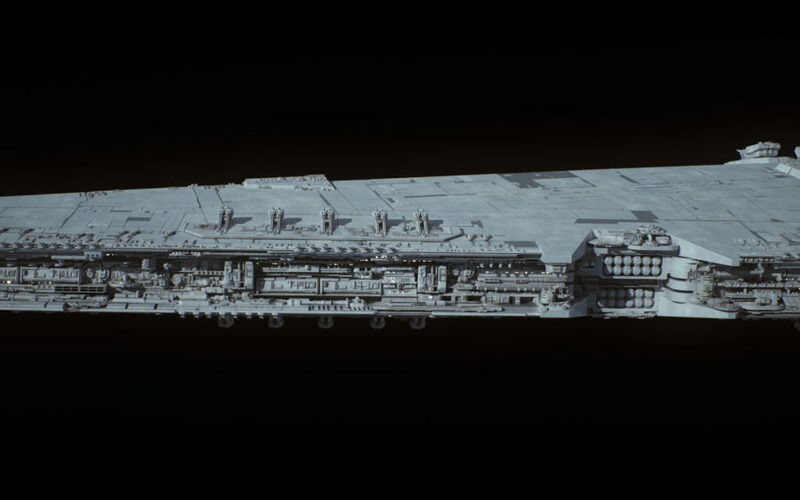 Perhaps it could be a carrier, taking design cues from real life examples, i.e: a control tower on one side? 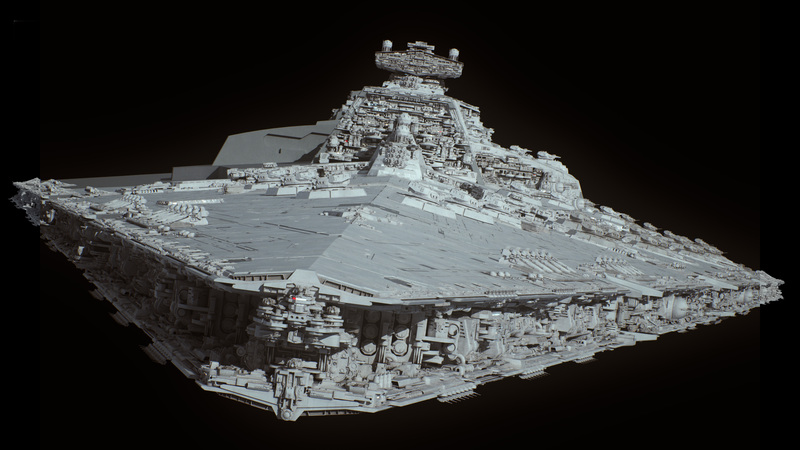 Whilst I’m replying to this, what about the Chiss star destroyer. 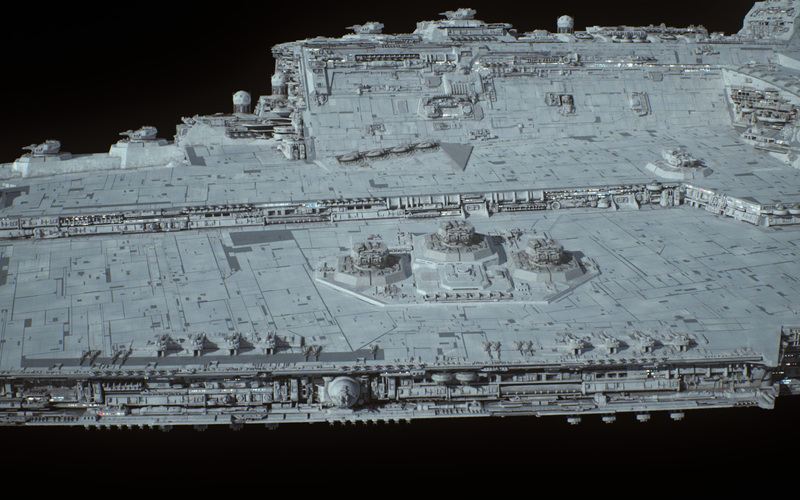 It’s described as being smaller than the ISD, with all weak points (let’s say large points) removed. Wet-navy carriers use offset control faciliities ’cause their air wings need every inch of possible launch/recovery/storage/maintenance space; said resources are much less of a problem for your average kilometer-and-change-scale SW ship with hover-capable fighters & tractor beams. This ship’s asymmetric tower *might* be a ‘simple’ case of hastily-field-patched battle damage. 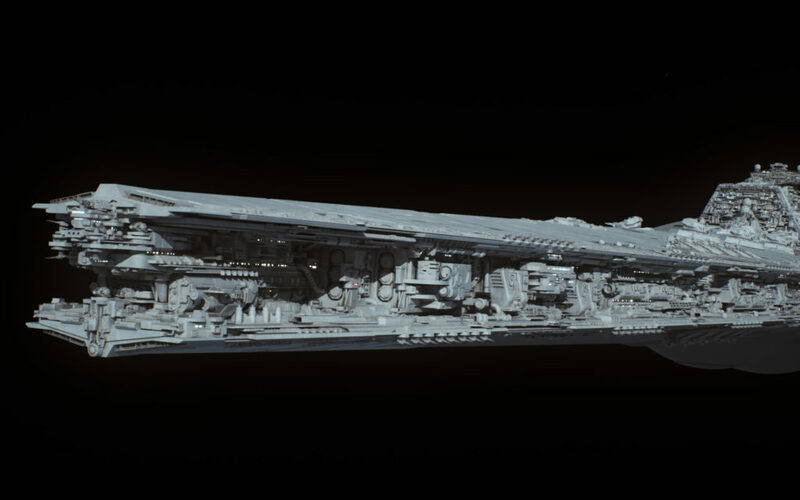 Dunno if I’d stick dorsal hangar ports & a grav-well projector that close together; this one might be an otherwise-conventional Impstar-ballpark destroyer with moderate interdiction capability. Since our host already has a quad-projector Dominator-class render, doubtful overhauling this particular Dark Horse doodle would move up the queue without a commission. I don’t think its a grav-well projector, IIRC its a secondary reactor section, nowhere near as powerful as the main reactor but still damn powerful, giving this ship all the energy and thrust she needs. 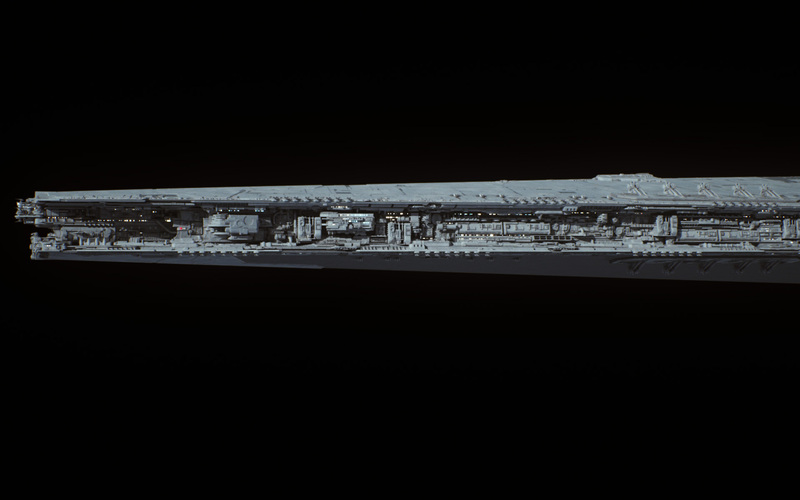 I was under the impression most dagger-style ship designs keep ‘tender’ bits like launch bays & protruding reactor bits on the ventral surface so their generally-better-armed dorsal facings can be oriented toward peer opponents with less risk of a vital component hit. 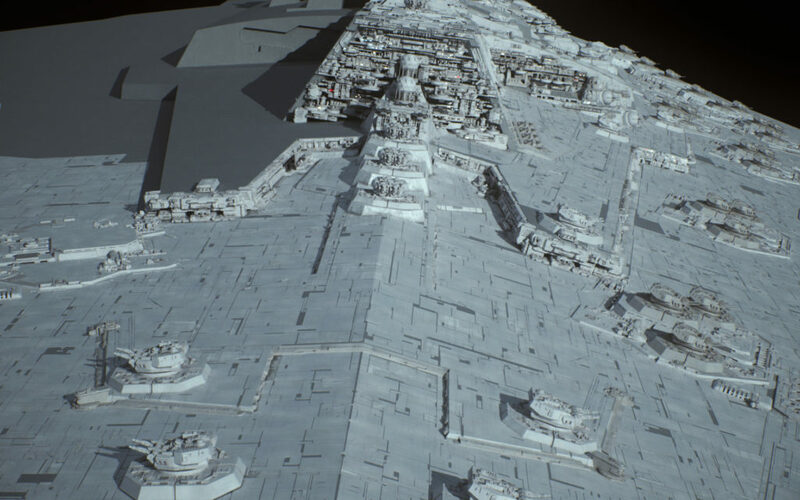 Thanks for the clarification gorkmalork, I agree the Interdiction capable cruisers we have seen in Star Wars lore use up a ton of interior space to run the disruption dome projectors. My only other guess is a refueling / refit service platform is berthed against it. 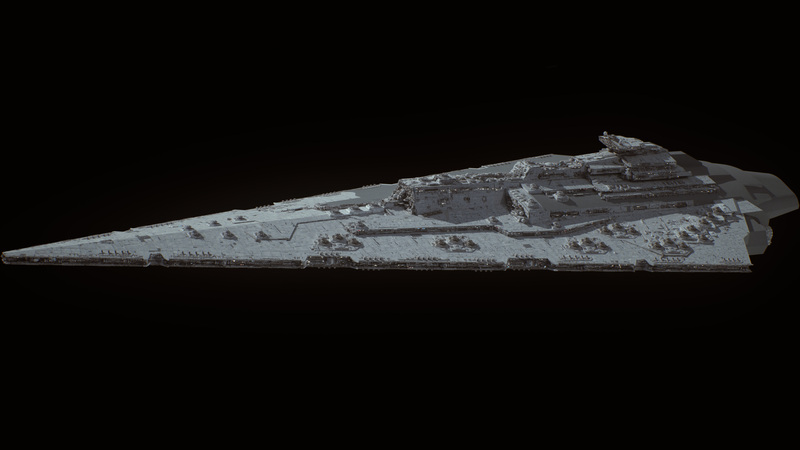 So a destroyer variant with the ability to top off frigates & corvettes? Could be handy for long-range patrols. Under what circumstances would refueling via dedicated tanker be more efficient than jumping back to a regional fleet base? When warships are never more than a few hours from a base rather than days/weeks, the operational paradigm seems much more like WW2 aircraft than wet-navy operations. 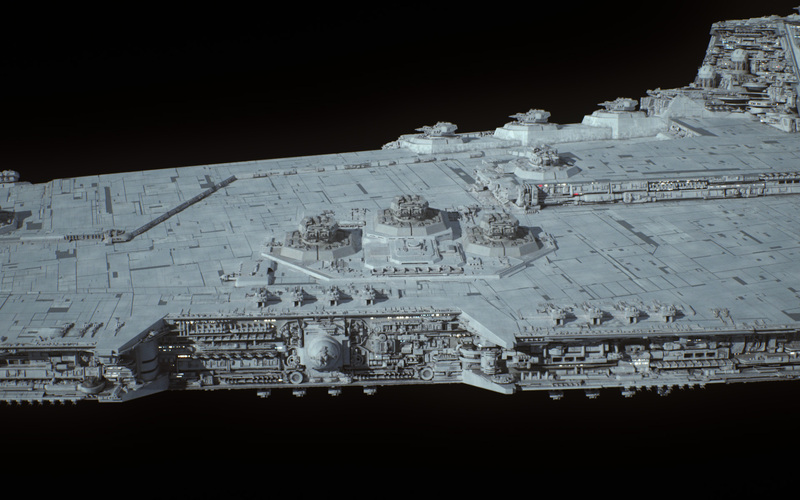 How long of a range do you think capital ships have? Civilian pleasure craft can seemingly cross the galaxy without need of refueling, while you would think that dedicated warships would devote much more of their mass and volume to fuel than random yachts. You can’t completely blame the distances on Disney. It’s always been somewhat fast to travel across the SW galaxy, dating back to the OT and the not-months journey from Tatooine to Alderaan. There was plenty of space so to speak for regional and specific variation in travel times, but one could get across the galaxy pretty fast pre-canon transition. I’m curious. Who’s on your list? Sounds fun enough. I use to run an SW roleplay room and added a travel time mechanic to the chagrin of the people inside, but it’s really their own fault for jumping across the galaxy in a Class 2 rustbucket and it taking 2 irl weeks. Check their perception by breaking Hyperdrive and making backup hyperdrive 12 class. True. Easy to forget that just because the Falcon can make a super-fast jump doesn’t make it normal for everyone else. I remember the idea has been out there, that in hyperspace travel time is not defined by a limit on the max velocity of a ship – meaning ships could in principle go arbitrarily fast – , but rather by the availability of data on hyperspace routes, processing power of the nav computer, and maybe the willingness of the pilot to take risks. So with very accurate, up-to-date data, a top shelf navicomputer and some recklessness you can jump vast distances in a short time. I don’t think this knot about travel times and distances will ever fully be untangled. But at least there are more degrees of freedom to work with than just speed and distance. Actually distance becomes much less relevant under the assumption on hyperspace travel made above (–>it’s all in the information, or you could say only the ‘road quality’ limits your driving speed). In that way as an extreme example two points across the galaxy could be effectively ‘closer’ than neighbouring star systems. I think you’re right; the “knot” can only ever be considered untangled if viewed from a certain point of view. And I agree that there will be extreme examples where planets on opposite sides of the galaxy will be relatively close in travel time terms; I just disagree that it should be the norm. To be fair regarding ROTS, there is some evidence Utapau at least spanned a course of days. Wow, the 4th image looks so terrifyingly epic! 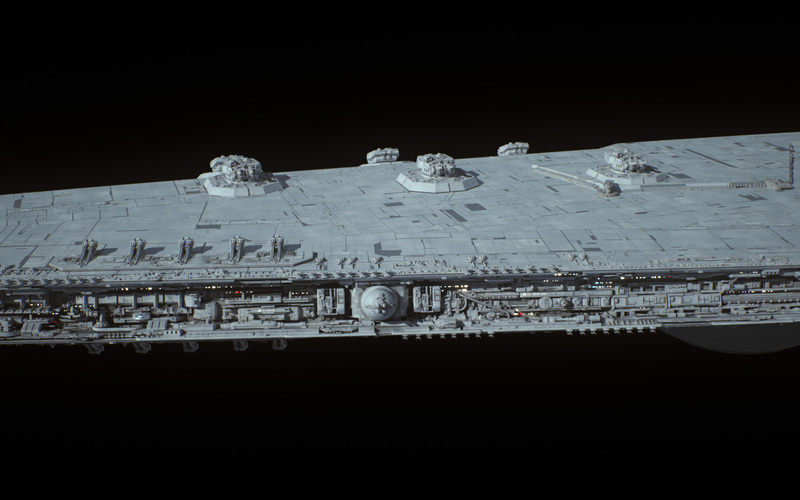 I’d hate to be staring that down in any ship short of another dreadnought or battlecruiser. That main reactor dome lends the beast some ominous extra heft in those two near-prow-on shots. Plus, neatly-blended bow missile tubes & guidance aerials.